Yesterday’s adventure revolved around witnessing the incredible cloud forest in La Fortuna, Costa Rica from a totally new angle. Thus far, I have been totally amazed walking, hiking and running through various, different forests in central America. However, I have always been at the ground level. 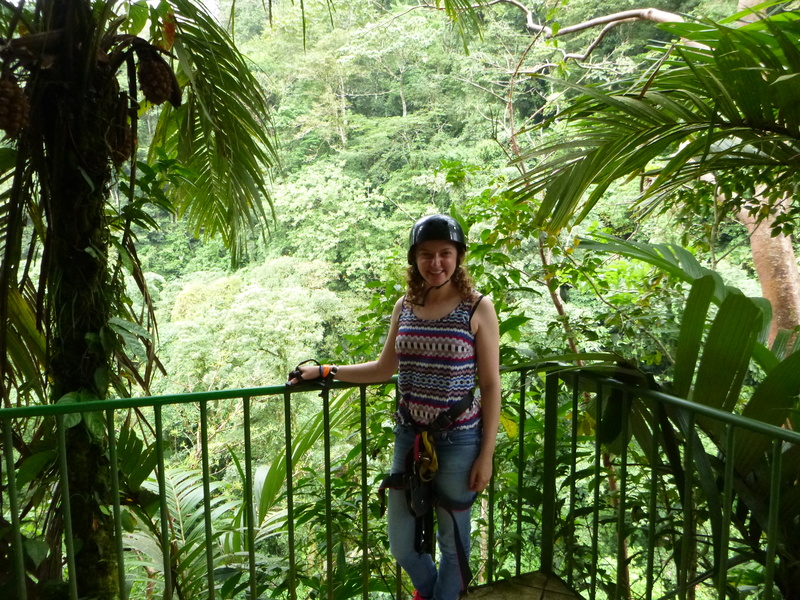 Yesterday I was lucky enough to zip line over the forest canopy. This was jaw dropping. 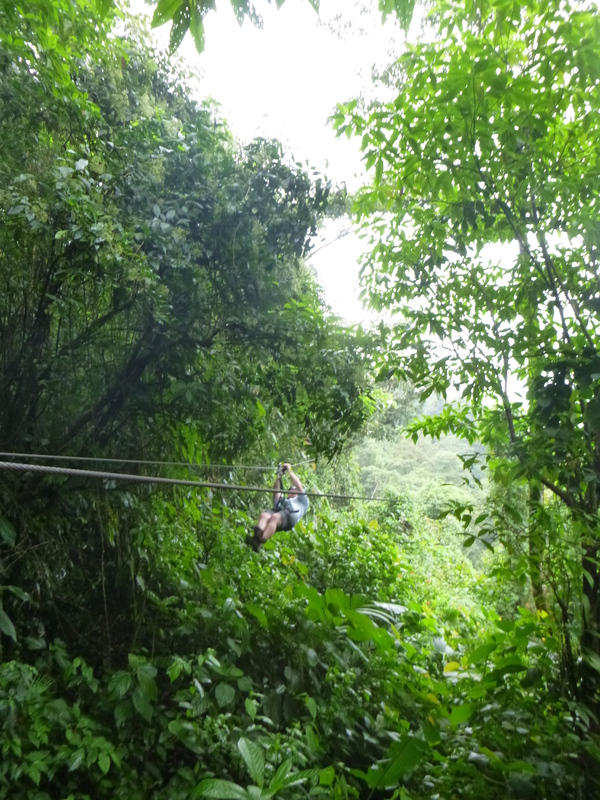 I saw the dense forest trees and distant pastures while zooming across eight fantastic zip lines. Colourful birds swooped around in front of me, misty clouds floated in the distance, while I heard the gushing of water from a nearby river cascade. Just when I thought the adventure was over, we got to repel down a vertical cliff to a fast flowing, blue, rocky river. It was quiet some height and slightly unnerving. As soon as I began the descend my fears vanished. It was fairly easy jumping of the rock face lowering myself down. I got to rather near the bottom where I was instructed to let go of the rope and hold onto my harness. It seemed simple enough. Then the guide, suddenly let gravity throw me down. My heart leapt and I screamed. I was not expecting such a quick landing. It was tonnes of fun albeit rather terrifying. After, this adrenaline filled morning I visited the hot springs next door. They were lovely. I covered myself in volcanic mud, waited for it to dry before washing off and lazing around in the natural hot water. They were surrounded by lovely trees homing colourful red flowers. A relaxed afternoon was perfect. I left in time to get back to the hostel to think about where to go the next day. Getting from place to place in Costa Rica is somewhat tricky on a budget. All the public buses seem to go to the capital – San Jose. Meaning where ever you go, you have to waste time back tracking and taking numerous buses. The public buses are also not as cheap as the rest of central America from 5 us dollars to 10 depending on distance. So if you have to take four it mounts up. Consequently, I have been taking a mixture of tourist shuttles and public buses. While the tourist shuttles are more expensive they are so much easier taking you from hostel to hostel. My least favourite thing about the shuttles is booking them. Especially in La fortuna, where every tour agency says a different price and seems rather untrustworthy. How it works is, the bus driver companies sell seats to the tour agencies, who then sell the seat to you at an increased price. They thought I didn’t understand Spanish (I heard the whole phone call). Consequently, you can try to bargain. Lots of the tour agents appear super desperate to sell you their ticket which puts me off. The number one thing is to shop around. I have been booking things the night before and I just make sure to go to a few agents to check out the general prices before booking with the cheapest. Also you want to go with a shop not the random guy who stands in the side of the road. These people are fakes and will take your money and run. I always make sure to buy a ticket from someone who will be in the shop everyday, so you know of something goes wrong where to find them. The best thing would probably be to find out the telephone number for these bus companies and book directly with them. However, this is probably near impossible to do as otherwise these tour agencies would be out of business.